The additional smaller size is available in both gold and green colors across a total of six styles – four jackets and two overalls. Extremely comfortable and flexible, the Iron Eagle protective apparel has the durability to resist fats, oils, pine tars, gasoline, grease and a variety of other chemicals. With heat sealed seams that are stronger than the material itself, these garments can withstand extensive laundering. A two-mil exterior coating that is easy to decontaminate and offers unbelievable snag resistance helps make the Iron Eagle ideal for the toughest work conditions. 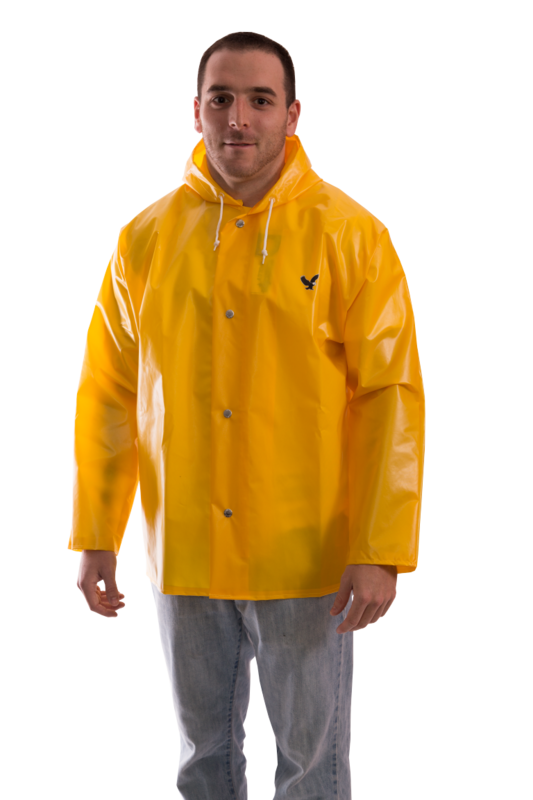 The Iron Eagle line includes a complete offering of jackets, overalls, hoods, and protective sleeves – all featuring the comfort, quality, and durability that make Iron Eagle the leading brand of protective clothing for food processing. Tingley protective footwear and clothing have been protecting generations of workers since 1896 and are available from authorized distributors in the US and Canada. For more information, please contact a Tingley Sales Representative or visit the Tingley website at www.tingleyrubber.com.